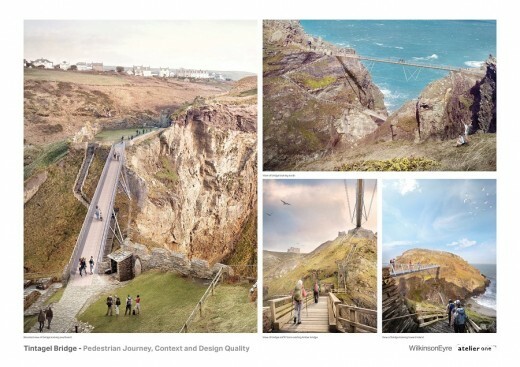 March 23 2016 – English Heritage announced today, March 23 2016, that the team led by Ney & Partners – with emerging UK-based architectural practice William Matthews Associates – has won the Tintagel Castle: Bridge Design Competition. 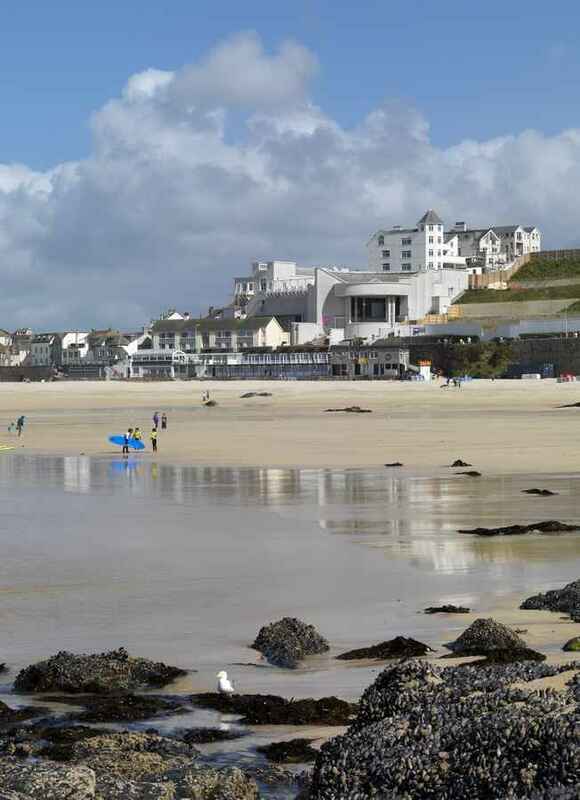 The expert jury reached a majority decision on the winning team, which beat 136 others in the course of the two-stage international design competition to secure the architectural and engineering commission for the circa £4m English Heritage project in Cornwall. The winning concept design is distinctive for its elegant, delicate profile and structural ingenuity. 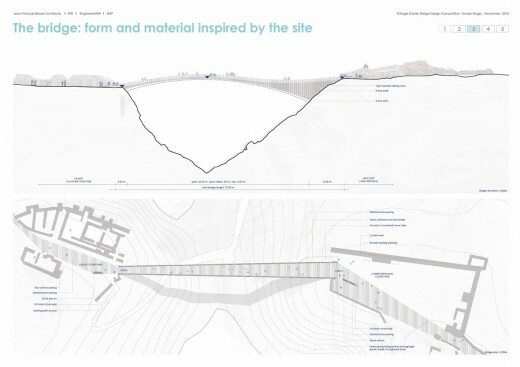 The proposal is based on two cantilevers and envisages a poetic gap between the two; it will recreate the land-link that once existed between the mainland and headland and reference the current void, caused by erosion. 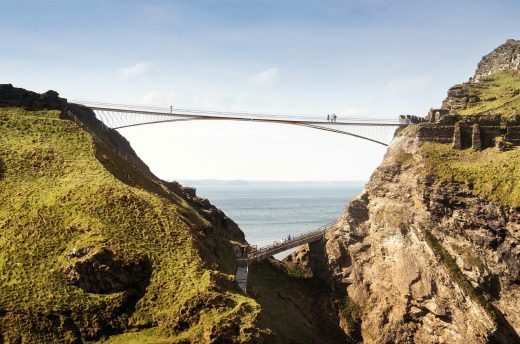 The team’s inspiration for their cantilevered solution came from their study of Celtic history and the original drawbridge arrangement of Tintagel Castle. 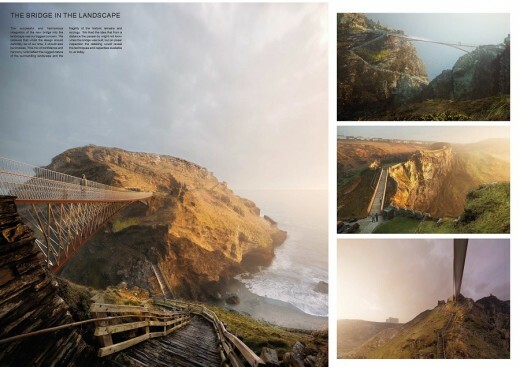 They propose using local slate for the bridge’s decking and contrasting weathered and non-weathered steel to create finishes which allow sunlight to play on the structure but also give it an ephemeral quality, allowing the bridge to harmonise with the coastal landscape. 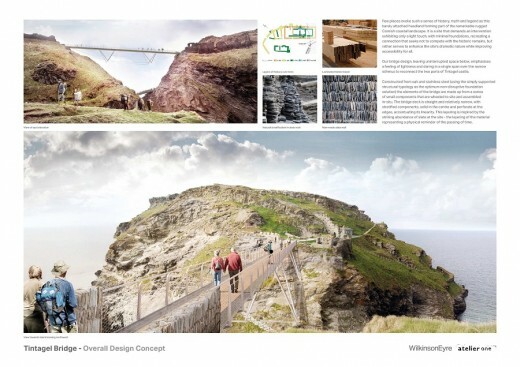 The concept design was popular with the public following an exhibition held in Tintagel village in December 2015 (view shortlist). 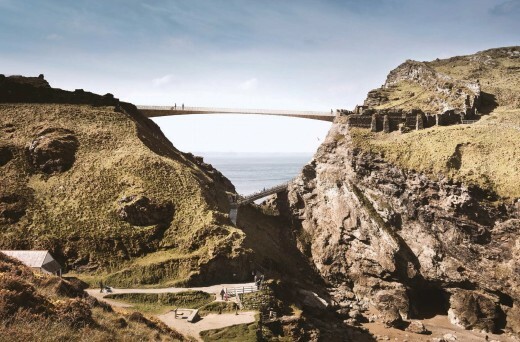 The new bridge, twenty-eight metres higher than the current crossing, is expected to transform the visitor experience of Tintagel Castle, improving understanding of, and access to, this historic site, one of the most dramatic and loved in English Heritage’s care. “The winning team’s concept is daring and very exciting. It is not the final design but instead a brilliant indication of the team’s talent and imagination. 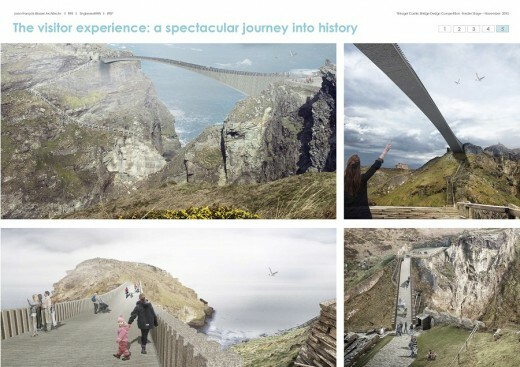 We will now work with them on a design that will both complement the spectacular landscape and unlock for the visitor the history of the site. 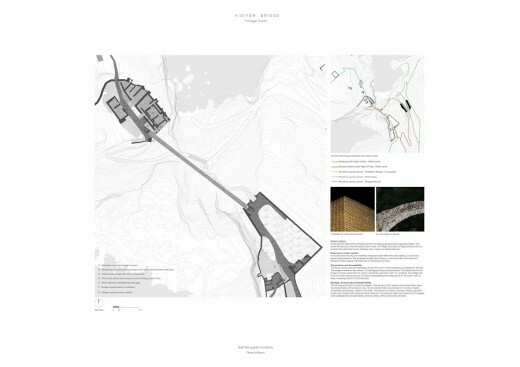 Ney & Partners is a renowned bridge designer with offices in Belgium, Luxembourg and Japan. All the firm’s projects ‘are driven by a strong relationship to context and by the poetic value of design, engineering and architecture’. 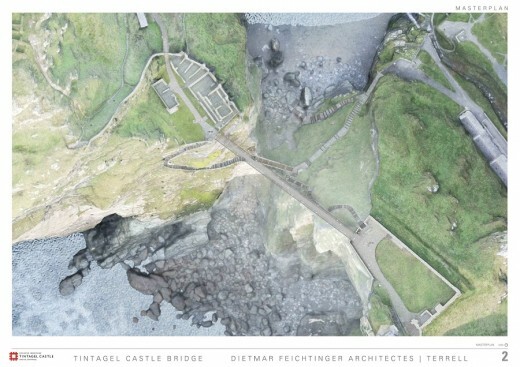 While the firm has produced nearly 100 bridge designs over the last 18 years, recent projects include two footbridges to encircle the UNESCO World Heritage site at Smedenpoort Gate in Bruges, Albi Footbridge in France and the Dejima Footbridge in Japan (a future UNESCO World Heritage site) and the roof of the Dutch Maritime Museum in Amsterdam. William Matthews Associates is an emerging architectural practice based in London. Prior to establishing the firm in 2013 William was an associate at Renzo Piano Building Workshop where he was lead architect of the Shard. 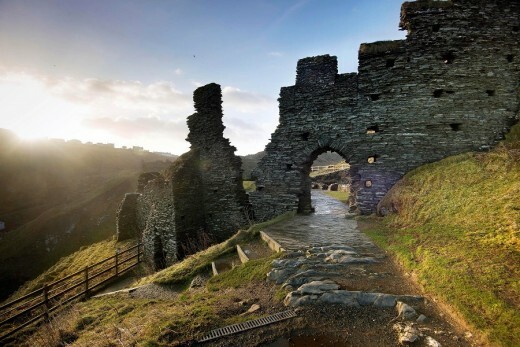 Attracting over 200,000 visitors annually, Tintagel Castle is one of the most spectacular historic sites within English Heritage’s care. 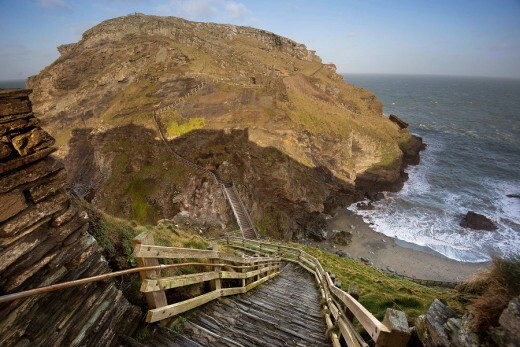 This scheduled ancient monument is inextricably linked to the legend of King Arthur and has been prized throughout history for its elemental qualities and spirit of place within this area of outstanding natural beauty. Development of the design will now commence in advance of consent applications later in the year. The project is expected to be completed by 2019. Ney & Partners is an award-winning bridge designer with offices is in Brussels, Luxembourg and Japan. Since its foundation in 1996, the firm has developed a distinctive methodology and design culture. As a team, Ney & Partners is not bound by preconceptions or dogma. Innovation and a willingness to challenge traditional engineering hierarchies are key values for the team. Each individual project is driven by a strong relationship to context and by the poetic value of design, engineering and architecture. 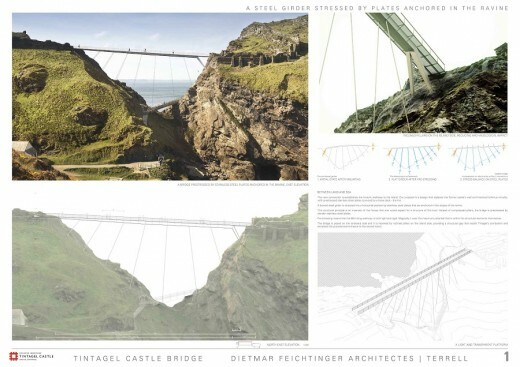 Over the last 18 years, the firm has produced nearly 100 bridge designs, and their expertise in this field informs their work in other typologies. They integrate different disciplines throughout their projects, regularly working in partnership with artists and landscape designers. Notable projects include: the Bridge ‘De Oversteek’ and ‘De Lentloper’ in Nijmegen, (NL), Vroenhoven Bridge in Riemst (BE) and the Second Schelde Bridge in Temse (BE) In their portfolio a wide range of intriguing footbridges in the Netherlands: Zwolle, Amsterdam and Leiden as well as in Belgium in Brussels, Knokke and Kortrijk. Recent projects include two footbridges to encircle the UNESCO World Heritage site at Smedenpoort Gate in Bruges, Albi Footbridge in France and Dejima Footbridge in Japan (a future UNESCO World Heritage site) and the roof of the Dutch Maritime Museum in Amsterdam. William Matthews Associates is an emerging architectural practice established in 2013. Prior to establishing the firm William was an associate at Renzo Piano Building Workshop in Paris, where he worked a several renowned projects including the Fondation Beyeler, Potsdamer Platz and the Art Institute of Chicago. From 2001-2013 he led the design team for the Shard in London. In 2014 the practice won an international design competition for the renovation of the Union of Bulgarian Artists in Sofia. 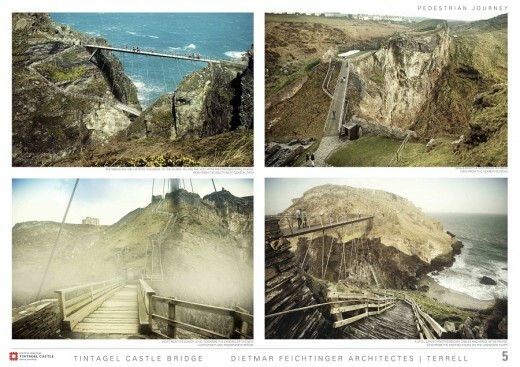 Other current projects include a footbridge linking two buildings on Great Portland Street in London; a café pavilion in Canada Square, Canary Wharf; and a private house on the white cliffs of Dover. From 137 first stage entries, six design teams were shortlisted and asked to produce concepts. These concepts, including a short description from each design team, are below. These concepts are not the final designs but give an indication of the approach each team would take. 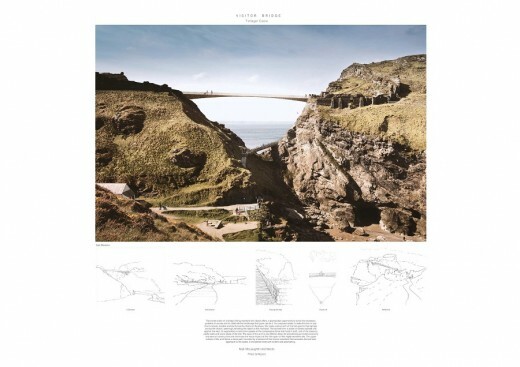 These concepts will also go on display in the Tintagel village Tourist Information Centre (4th December – 11th December 2015, daily 11am-6pm) and English Heritage is asking the public for their thoughts on the different approaches. This feedback will be passed on to the competition Jury, who meet in January 2016, with the winner announcement due in early February. The new connection re-establishes the historic walkway to the island. 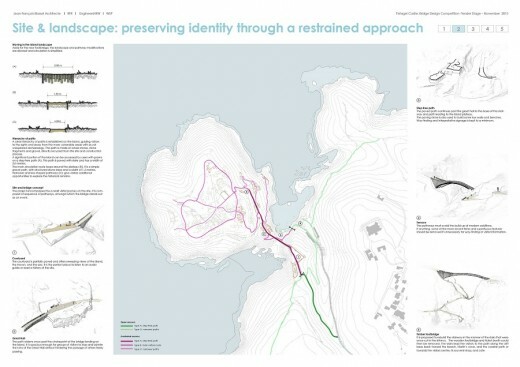 Our proposal is a design that replaces the castle’s former wall and historical isthmus virtually, with cables crowned by a linear element – the link. A bowed steel girder is stressed into a horizontal position by stainless steel plates that are anchored in the slopes of the ravine. This structural principle is an inversion of the forces that one would expect for a structure of this kind. 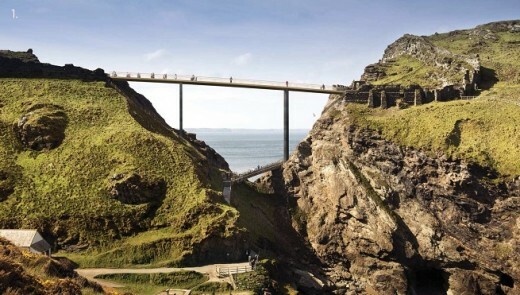 Instead of compressed pillars, the bridge is stressed by slender stainless steel plates; pre-stressing means that the 65m-long walkway is both light and rigid. Magically, it uses the maximum potential that is within the structural elements themselves. The bridge is posed on the landward side and it is received by inclined pillars on the island side, providing a structural gap that recalls Tintagel’s symbolism and recreates the processional entrance to the sacred island. 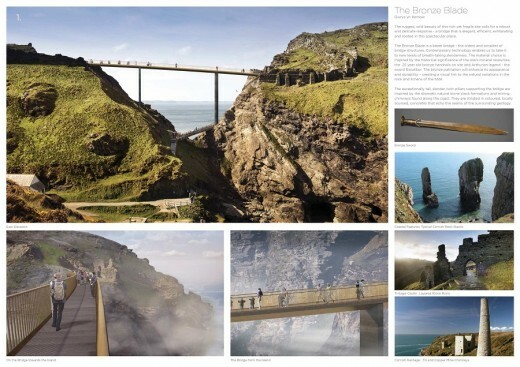 The rugged, wild beauty of this rich yet fragile site calls for a robust and delicate response – a bridge that is elegant, efficient, exhilarating and rooted in this spectacular place imbued with mystery. The Bronze Blade is a beam bridge – the oldest and simplest of bridge structures. Contemporary technology enables us to take it to new levels of breath-taking slenderness. 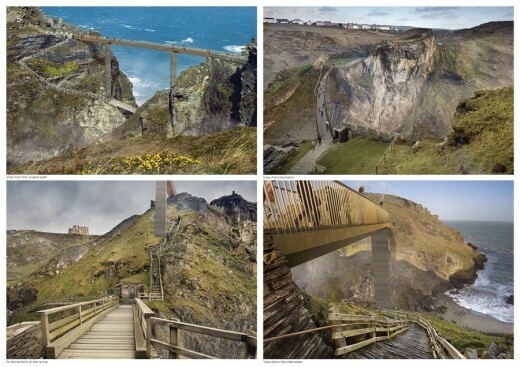 The material choice is inspired by the historical significance of the site’s mineral resources; bronze handrails on site and Arthurian legend – the sword Excalibur. The bronze patination will enhance its appearance and durability – creating a visual link to the natural variations in the rock and lichens of the SSSI. 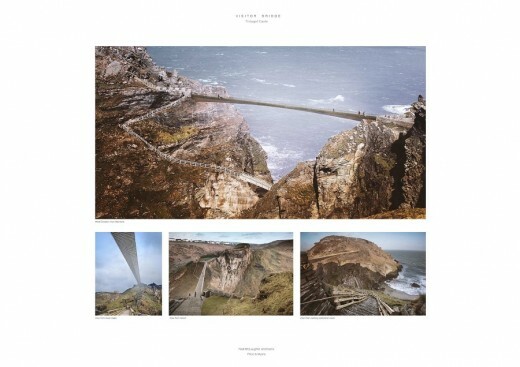 The exceptionally tall, slender, twin pillars supporting the bridge are inspired by the dramatic natural stone stack formations and mining chimneys found along the coast. They are striated in coloured, locally sourced, concretes that echo the dynamic seams of the surrounding geology. 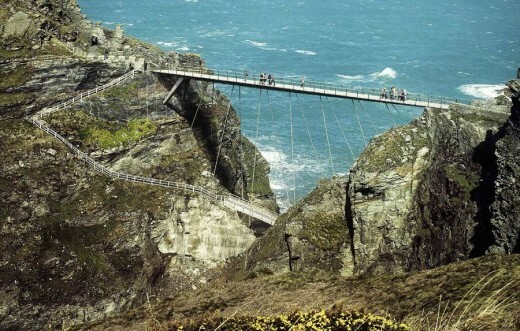 The Tintagel Castle footbridge is based on a simple concept: to recreate the link that once existed and filled the current void. Instead of introducing a third element that spans from side to side, we propose two independent cantilevers that reach out and touch, almost, in the middle. Visually, the link highlights the void through the absence of material in the middle of the crossing. 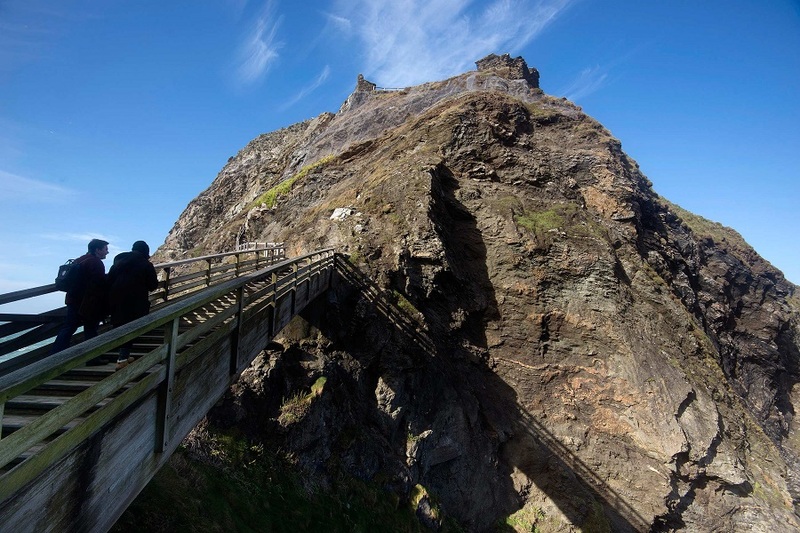 The structure – 4.5m high where it springs from the rock face – tapers to a thickness of 170mm in the centre, with a clear joint between the mainland and island halves. 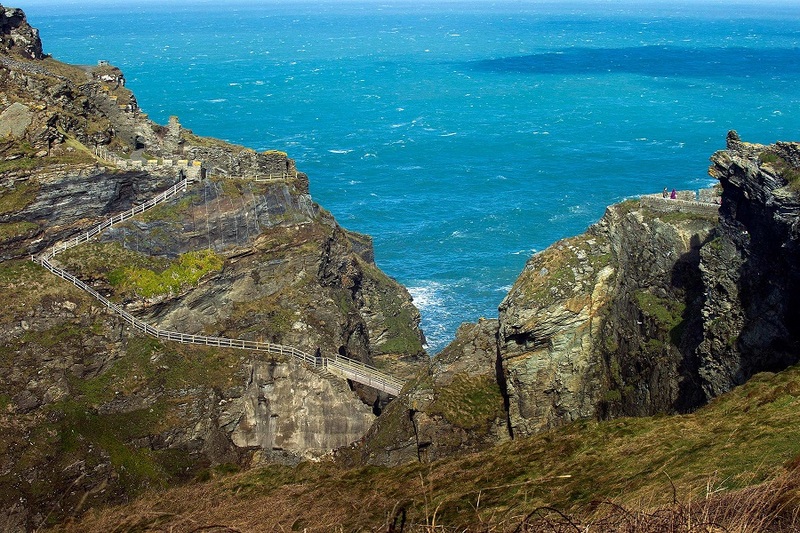 The narrow gap between them represents the transition between the mainland and the island, here and there, the present and the past, the known and the unknown, reality and legend: all the things that make Tintagel so special and fascinating. 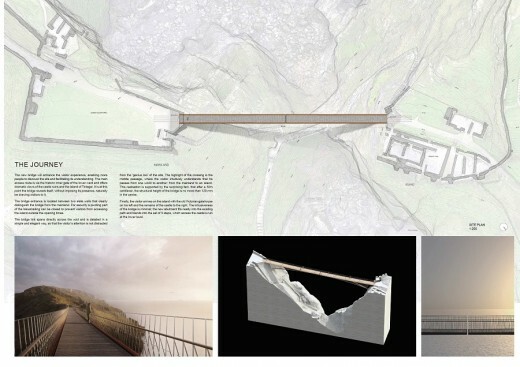 The construction of a bridge linking mainland and island offers a spectacular opportunity to solve the problem of access and to celebrate the landscape. 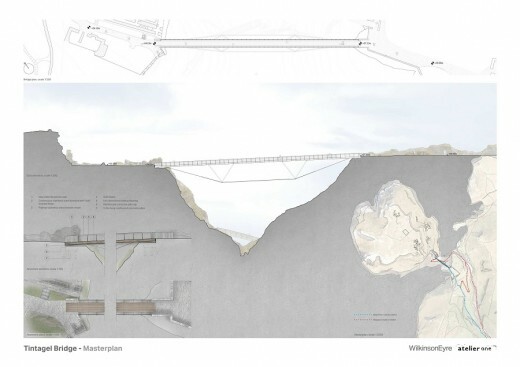 Our proposal makes this link in way that is simple, durable and reinforces the place’s drama: a stone arch of Cornish granite springs across the chasm, seemingly tethering the island to the mainland. The arched form is made of stacked stones. Its segmented construction speaks of the compressive force that holds it aloft, and of the masonry castle walls and stone strata of the site. The apex of the arch is just 200mm deep. 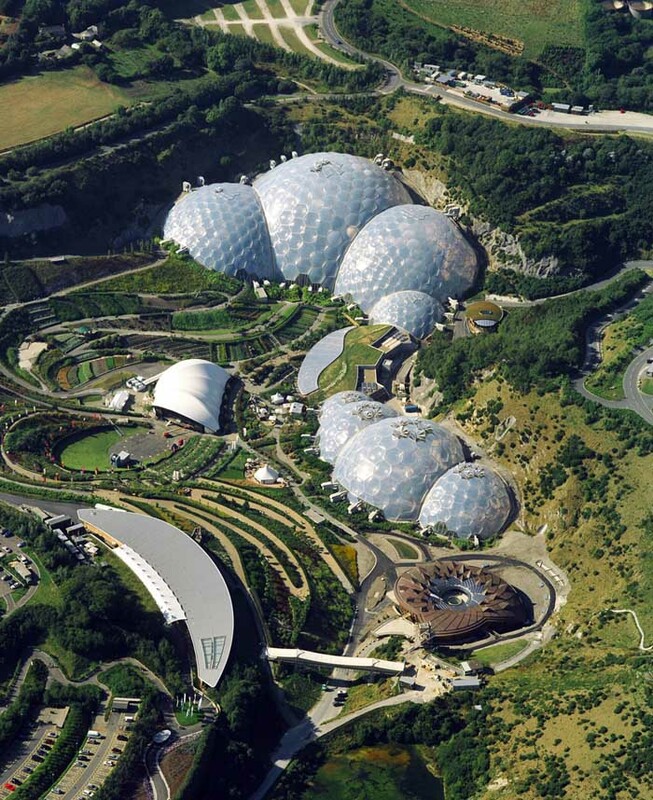 Its slenderness promotes economy, ease of construction and minimises the visual impact of the 70m span on this sensitive site. The upper surface of the arch forms a stone path bounded by a handrail of fine bronze balusters that recreates the lost land approach to the castle. It should feel both self-evident and astonishing. High above the waves, the stone arch bridge evokes the solidity of the ancient pathway and isthmus that once existed in its place. The narrowing form of the granite structure echoes the ‘choke point’, the ‘Din Tagell’, which gave the island its name. 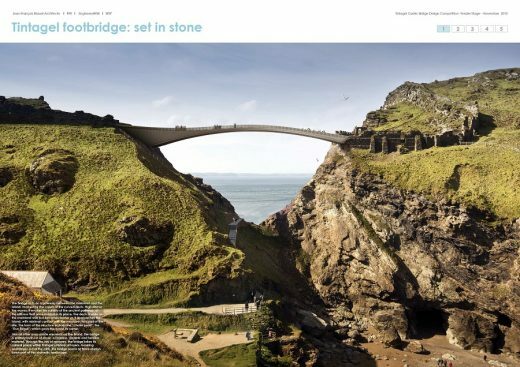 Through the use of natural stone, the bridge takes its place within Tintagel’s historical layers. 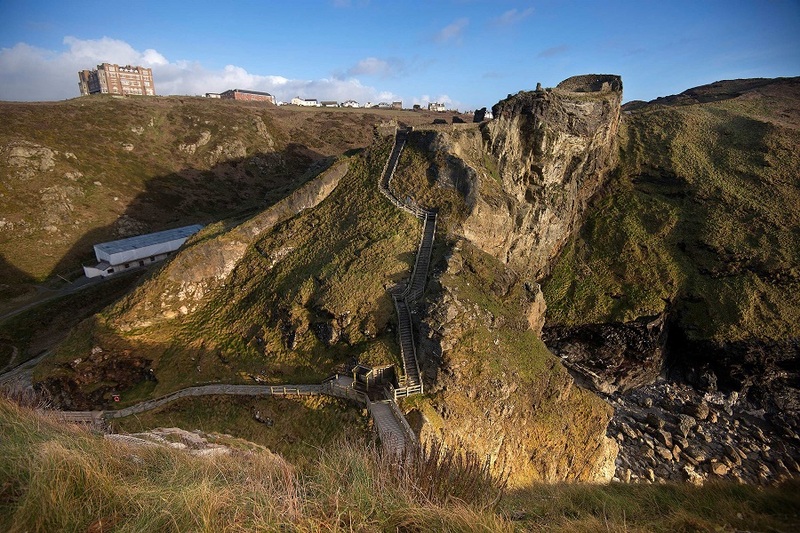 It grows seamlessly from the cliffs, fitting naturally within this dramatic landscape. The design team is jointly led by award-winning French engineering firm RFR and Jean-François Blassel. Blassel is a Paris-based architect whose designs are marked by simplicity of function and purity of structural principle, allowing structures to go beyond their primary function and become architectural complements to their surroundings. RFR and Blassel are supported by EngineersHRW, a UK-based practice with a refined aesthetic approach to structural engineering. WSP Parsons Brinckerhoff will provide key expertise with environmental, geotechnical, and constructability issues. 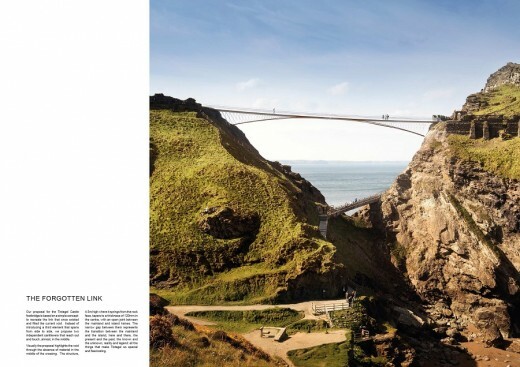 WilkinsonEyre and Atelier One have designed a bridge, with uninterrupted space below, which emphasises a feeling of lightness and daring in a single span. Our modern, light touch intervention uses minimal foundations to recreate a connection over the narrow isthmus between the two parts of Tintagel Castle. 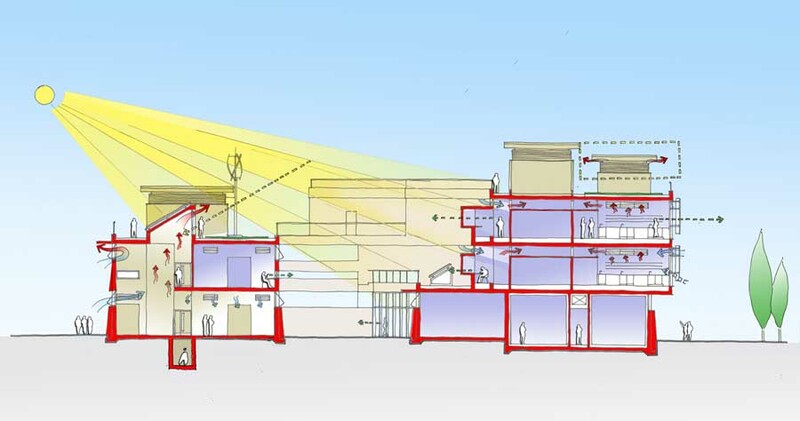 It seeks not to compete with the historic remains, but rather serves to enhance the site’s dramatic nature while improving accessibility for all. Constructed from oak and stainless steel, the elements of the bridge are made up from a series of small components that are wheeled to site by hand and assembled in-situ. The bridge deck is straight and relatively narrow with stratified components, solid in the centre and perforate at the edges, accentuating its linearity. This layering is inspired by the striking abundance of slate at the site – the layering of the material representing a physical reminder of the passing of time. 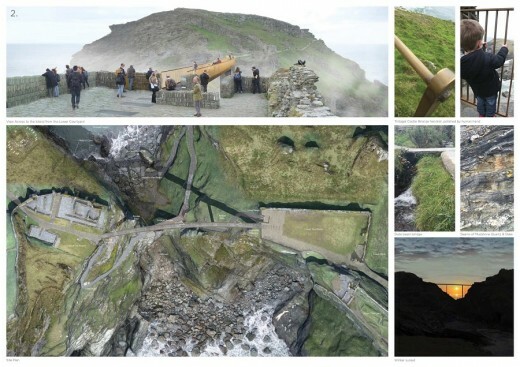 To comment on the concepts, please email tintagel.bridge@english-heritage.org.uk by 11th December 2015.